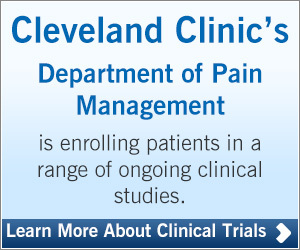 Cleveland Clinic’s Pain Management Department is launching a new lifestyle program for chronic pain patients. It is clear, that present methods for treating chronic pain are varied and often only temporarily effective. They can also be limited by side effects and contraindications. Medications are limited by an individual’s development of tolerance to drugs, and in the case of narcotics, subject to the possibility of addiction and rebound pain. Centrally acting medications can interfere with sleep, cognition and mood. Neural blocks are an important tool, but we must be careful of the total number of injections over time. Surgery can be a literal lifesaver when other approaches are not effective, but is only performed once conservative treatments are exhausted. The ideal therapy would not have any negative side effects, it would apply to a wide range of chronic pain problems, and be demonstrably effective. We have found that true lifestyle modifications can do all of this and more and believe they should be part of an overall chronic pain patient’s treatment plan. To this end, Cleveland Clinic’s Pain Management Department is launching a new program for chronic pain patients called the “4 Pillars of Lifestyle.” The course will be offered to the following patients: those with chronic pain who are open to complimentary strategies, obese patients, patients with inflammatory diseases and pain, and patients with identified disruption in one of the four lifestyle pillars. The course will focus on helping patients manage the following areas of lifestyle: sleep, diet, exercise and stress, all of which have a substantial impact on inflammation in the body, which is the principle mediator of most chronic pain. Diet is pivotal to management of inflammation. We have already established a patient education program for the anti-inflammatory diet, a Mediterranean Diet variant. While there are a number of suggested diets, we have selected the Anti-inflammatory Diet as the most reasonable and effective for the widest number of people. The program provides general dietary advice and there are follow-up visits to provide continuing support and evaluation of progress. The management of chronic pain includes a sufficient amount of sleep, but this aspect of healthy lifestyle interacts with diet in a distressing manner. There is evidence that a lack of sleep can lead to weight gain. Conservative therapy of sleep deprivation is desirable, and we should try to avoid the use of any medications. Many chronic pain patients are already on medications that potentially interfere with sleep. Conservative therapy can include a simple set of behavior changes summed up by the term “sleep hygiene.” Further therapy might include old remedies like a carbohydrate load just before bedtime, hypnosis or acupuncture for additional approaches to sleep. Stress is like the “volume control” on pain, but its reduction is perhaps the hardest thing to control. Stressors are very individual, but there are some therapies that seem to be universally useful. Recommendations include meditation, yoga and tai chi, but part of any useful program of stress reduction is a discovery that these practices can be extremely helpful to the patient. Referral for counseling can be a very useful adjunct to suggested protocols and things a patient may already be pursuing. Exercise can be a significant contributor to reducing pain. Often something as simple as a daily walk can not only improve a patient’s pain profile, but can also reduce stress. Of course, all recommendations for exercise need to be reviewed to maintain safety. In this same regard, we will provide guidance that helps patients avoid overexertion based on their pain or coexisting medical conditions. Follow-up appointments will be used for this type of counseling. Often some of the simplest actions are the most effective ways to control pain, but they can get lost in highly structured treatment protocols. We believe it is important for patients to have a chance to communicate with a healthcare professional about the day-to-day management of pain. We are presently setting up the capacity for virtual visits to expand the number of patients that can conveniently make these appointments. Dr. Dews is the Medical Director of the Pain Management Clinic at Hillcrest Hospital and Dr. Welches is an osteopathic physician in the Department of Pain Management.